More good news for Ultra lovers! 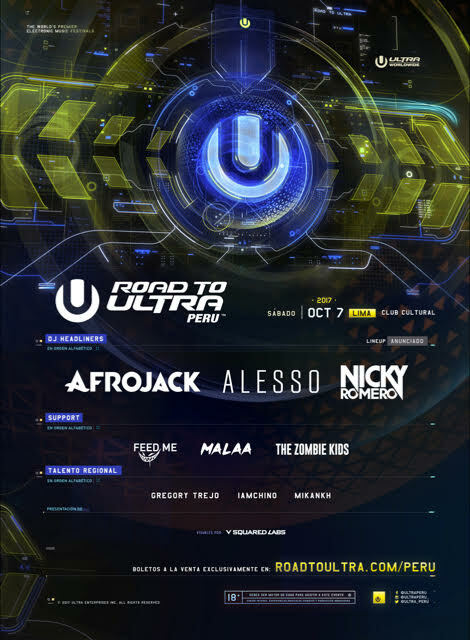 Road To ULTRA Peru is returning for its third edition this October 7th and have announced Afrojack, Alesso and Nicky Romero as headliners, with Feed Me, Malaa, and The Zombie Kids as support (Full line-up in the poster above). This year's show is being moved to Lima’s massive Club Cultural. This announcement follows the Resistance worldwide announcement which included news of Lima hosting its own Resistance show at Green Arena on October 13th, 1 week following Road To ULTRA Peru.